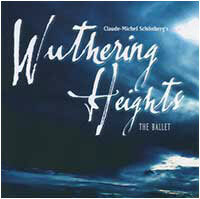 Claude-Michel’s first ballet, Wuthering Heights, premièred the Alhambra Theatre, Bradford on 21 September 2002 before going on a UK tour and being performed at Sadler’s Wells Theatre in London in March 2003. Wuthering Heights is ballet theatre, which endeavours to capture the spirit and soul of Emily Brontë’s heartbreaking story, while telling the story with music so clearly that there is absolutely no need to consult the programme to find out what’s happening. With haunting orchestrations by William Brohn, it is a work heavy with emotion and power and one that evokes the stark beauty and spirit of the wind-blasted moors and hills of Yorkshire. And it works so well because dance is about emotion, getting complex emotions across, and capturing the feelings of the people portrayed. It is, of course, a local story as Bradford, West Yorkshire, is not far from Haworth where the Brontë family lived. Originally Derek Deane of English National Ballet commissioned Claude-Michel to write the music. However, shortly after the score was completed Deane left ENB. Northern Ballet Theatre has a good reputation for successful narrative-led productions and so Claude-Michel contacted their new artistic director David Nixon. Nixon was ‘blown away’ by the fact that he’d never previously had the chance to work with a composer in devising a piece and had always had to pick existing music. He was inspired, almost seduced, by Claude-Michel’s music and his passion for it, although at times a little intimidated by the challenge of living up to it. But it was a genuine meeting of minds and Claude-Michel was thrilled to be working with a choreographer who so loved the music.